Cool! That came out very well. I like what you've done with the logo area. Very nice, Jokrik! That aluminium paint really looks like metal! I'm painting someone's CM Quickfire TK cover, and there's a part about preparing the cover that I thought others might find useful. Other than that, the cover has that signature rubber coating. It's very thin and can be wet-sanded off (with some effort) with 400-grit sandpaper. Had a kind of poor experience recently with some Rustoleum 2X Ultra Cover Paint+Primer. 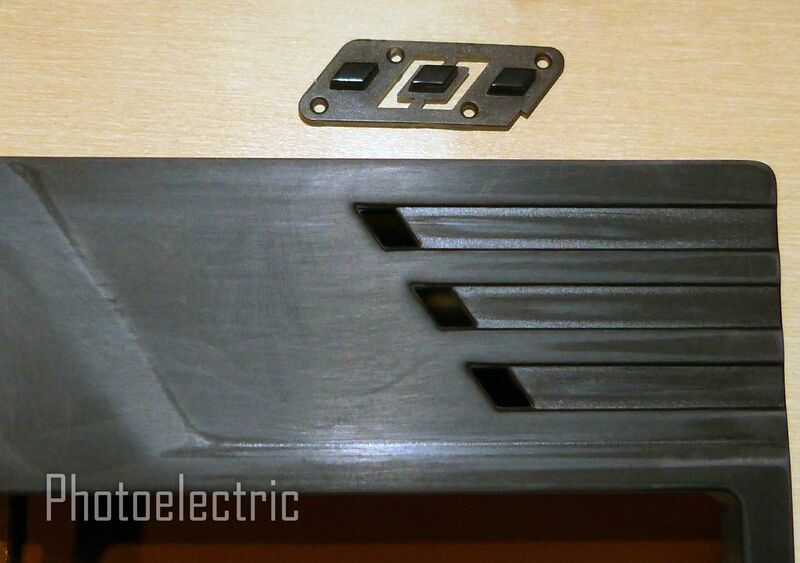 Painted two keyboard plates, sanded off the old paint from each, then primed with metal-etching primer. When I applied the Rustoleum 2X, I had several areas that crazed when it dried, and also got a lot of spatter (maybe that was the +primer factor?). It was odd because I was spraying the other plate with Rustoleum Camo (flat, no primer), and had no issues with that paint at all. Both over the same primer, both at the same time, so should be controlling for temperature/humidity. I ended up flatting the paint with 600-grit, then 2000 for a smooth surface. Four coats of matte clear, and it looks quite "vintage," sort of an antique Bakelite or lacquer finish. 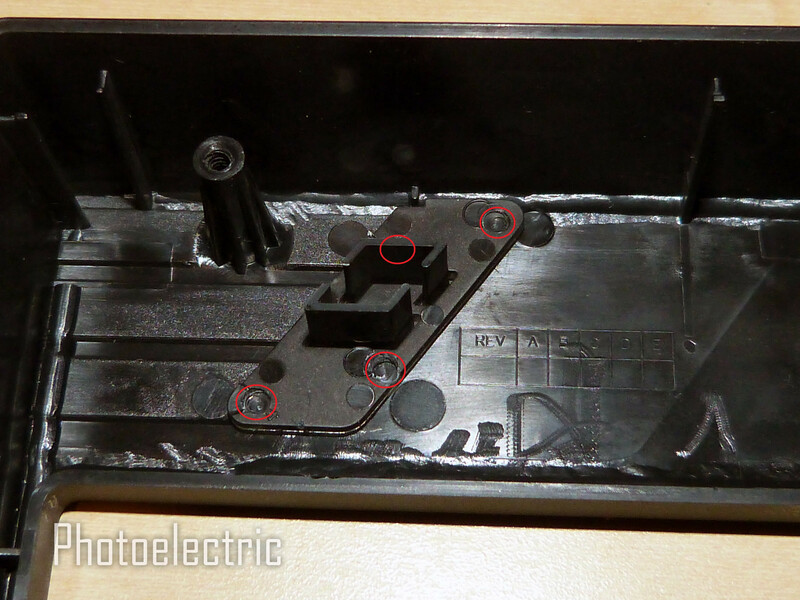 This plate is for one of the Televideo keyboards, so some irregularities will match the plate to the case nicely. Just wanted to flag this issue in case anyone else runs into the same problem. Hrm, I've not used that metal-etching primer. But I do wonder if something reacted poorly between the metal primer and the primer in the 2X paint. Seems unlikely. I'd recommend a veil of DupliColor Adhesion Promoter instead as it goes on very thinly and is transparent. I used it on a sanded steel Filco plate under DupliColor's MetalCast paint, and the finish was very hard. I tried scratching it with my nail after a week, and it didn't get dented or scratched at all. Sometimes surface preparation or environmental factors are to blame (as well as not waiting proper amounts of time to add extra coats). I've had some parts that I did not clean well enough--as it turned out--where paint would just melt off over time. All of a sudden I could see a greasy spot, rub it with my finger, and the paint would ball up as I'd roll my finger over it, and I could move it off. Clearly did not adhere and cure properly. Another thing I've had happen is base paint wrinkling and lifting when putting a clear coat on. I still haven't figured out what exactly happened in those times, but I am guessing it was due to base paint not sufficiently curing, even when I waited for a couple of days. Now I prefer to put a clear coat on right after base coat, whenever possible, to avoid that rare scenario. Although again, it may have been due to me cleaning the painted surface with soap and water and not following up with some harsher de-greaser before clear. And finally high humidity is very bad for aerosol spray cans. Paint doesn't dry well and comes out all cloudy and milky colored. I've used the Rustoleum 2X Ultra Cover Paint on my keycaps for a while now and I haven't had a problem. I'm not as familiar with paint and paint properties as others but as long as I speckle the paint instead of lay it on quick and thick it always comes out even and consistent. Updated with painting guidelines in the first post. Reading it now -- thanks for this Photo. And congrats on your Maker gear/star! Thanks! Let me know if anything doesn't look right or needs to be rewritten / be more comprehensible. 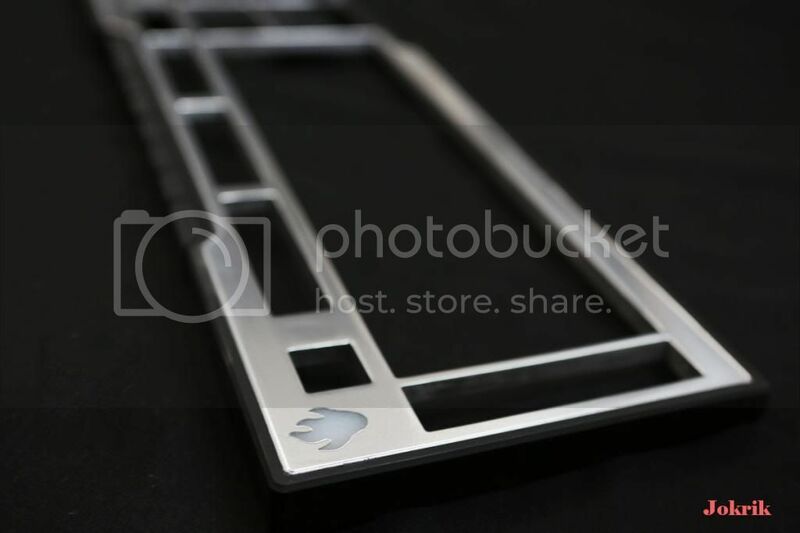 Any chance you would ever consider making a keyboard with a dry erase coating? Just because you could? It sounds like YOU should make a cover like that! Then tell us all about it. First I have to flock a case. I know, I know! It's either that or I have to help demik build the dog car from Dumb and Dumber. Any tips on painting chrome? In all seriousness....just make sure you speckle it right or else it won't settle right. All of those super-reflective metallic paints will accentuate the surface texture they are painted on. So if you're looking for a mirror-like finish, you need a very smooth surface to start with, and even then, I don't think you can achieve a truly chrome-like surface with spray paint out of a rattle can over plastic. It might still look interesting, and to each their own. I've never used chrome-like paint myself for the fear of it looking poorly, based on some photos I've seen, but someone here painted their cover silver chrome and then coated it with a clear coat. It made it look sort of like satin aluminum, if I recall correctly--a nice effect. I know Rust-Oleum makes gold, silver, and copper-chrome-finish paints. and I'm sure there are other brands. I think Krylon makes them too. P.S. : If you're looking for actual painting tips, just follow directions on your can. Shouldn't be much different. Clear coat will probably change the appearance of your paint, so I'd make some samples first. Yeah, I used duplicolor chrome on a qfr cover. As stated, the prep must be perfect as the faux-chrome is very thin and amplifies every little flaw. Also, the multiple thin coats are important to get a good uniform finish. I had my top prepped to 2000 grit. Also as stated, it was much shinier before the clear coat, but having used this before, I know how un-durable it it without a clear - think das shiny, but every fingerprint is permanent. What are my fellow GeekHacker's thoughts on me painting my incoming HHKB? Not just the case either....the keycaps too? You are a brave brave man? I like to think so from time to time. You have a deal. I don't have it yet but I'll ship them to you once they arrive. Pm me for details. 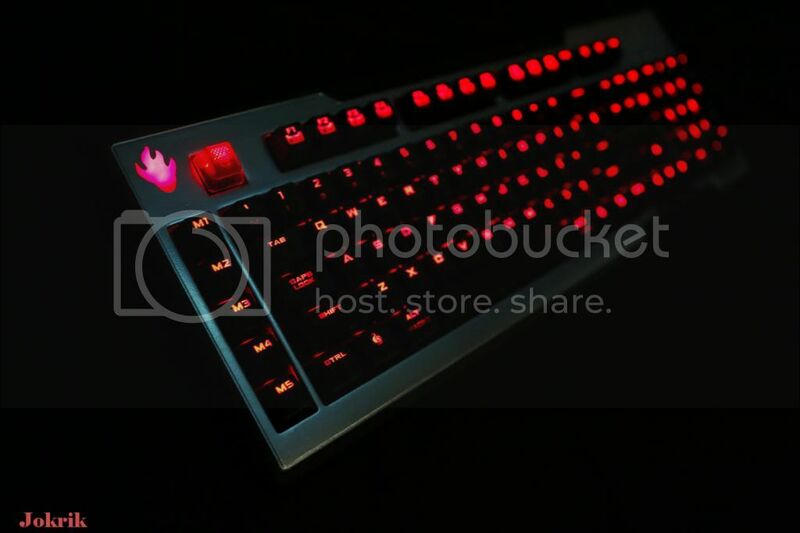 what color for the case you guys think would suit this keycap combination? 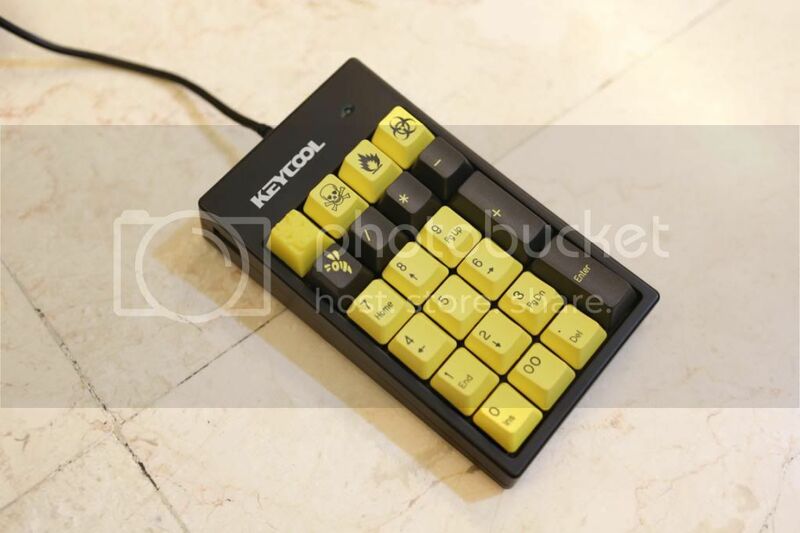 If you use yellow, you'll have to match it pretty closely, or you'll end up seeing the difference between it and the yellow keycap plastic. I'd do matte black and then paint some thin lines in yellow. Like racing stripes. just would like to say thank you for making this thread. a lot of valuable information. i started painting my case today using Rustoleum aged copper. built up plenty of light coats until i got even coverage all around. i noticed a few dust specks, as i am painting outdoors. do you usually wetsand inbetween coats, or before you apply your clear? Aged Copper takes a really long time to dry--I'd give it 5-6 days before you clear coat it. I've noticed that 3 colors from the Universal line are all slow to cure, and you can dent them even after 2-3 days. If you clear coat such slow drying paint too fast, you risk the bottom layers not fully curing in some places, because clear coats normally dry quickly and are quite hard. Which is why I recommend waiting for that particular paint. Don't wet-sand between coats--just after you've finished all the color coats or color + clear. You don't really need to sand it unless you want as smooth a surface as possible, but remember that by sanding flake / metallic paint like that, you'll be changing its appearance a bit. It will look more silver where you sanded, as more of the paint will be removed and metal flakes will remain. At least that's been my experience. I would let that particular paint cure well for 5+ days and then do 2-3 layers of clear gloss. Then couple days later you can wet-sand (2000-grit) + polish that. Regarding dust / fibers... yeah, those are terribly annoying, and that's the price we pay for not using proper painting booths. Not much you can do other than let the paint dry and try to rub them off with a bit of paper towel. You don't want to touch the surface with your fingers much, as that will introduce oils and dirt, and you'll be clear-coating it. You can scuff the surface lightly with wet 2000-grit sandpaper, rinse off REALLY well, buff with a soft paper towel or microfiber towels, use something to blow all the dust away from the surface (like a can of compressed air), then clear-coat. Oh and wash your hands with soap and dry them very well before handing prepped and painted pieces. It's not on the can... they claim it dries MUCH faster than I've found to be the case. Like Painter's Touch and Stops Rust lines dry dramatically faster. I don't hesitate clear-coating those right away. Universal paint however is a different story. It's beautiful, but definitely fickle and can be difficult to work with. P.S. : when you paint, I recommend using something elevated to hold your part. Either suspend it on a string, if you can, or put it on a tall box. This reduces the chance of dust landing onto your painted surface. Spraying on the ground is the worst, as you can stir up a lot of dust when you spray. just wanted to thank you again for this thread. here are a few shots of how mine came out. its only been rubbed out with rubbing compound so far. i still need to polish and wax. i'm extremely happy with how this case came out, so i'll be painting my other 2 keyboards as well. Why not plastidip? Works wonders on cars and can be peeled off whenever you want. You're welcome to pay with Plasti-Dip--nothing wrong with experimenting. I know some people have used it on their keyboards. To peel it off in the future, I believe you need to layer it pretty thickly, however. That is a beautiful case. Nice work alrgeez. Hey Photo, appreciate all the help with case painting. I did end up picking up some sponge sandpaper that seemed pretty soft, could that be a high grit? Thanks! Check in automotive supply stores--they sell 1000 and 2000-grit sandpaper. It looks like normal sandpaper, just finer grit. 1000 is still a little scratchy to feel. 2000-grit feels silky--deceptively so, as you can get quite a bit of paint/polish off with it when wet sanding if you overdo it. And 3000 grit just feels so soft. Ironic now that's supposed to sand off paint. I think 3000-grit is overkill for this. You won't make it any better by using that--if you can even find it for sale in a store. Polishing / cutting compounds will do as well after 2000-grit. Hi, I'm new to all of this painting stuff and kinda new to mechanical keyboards as well. 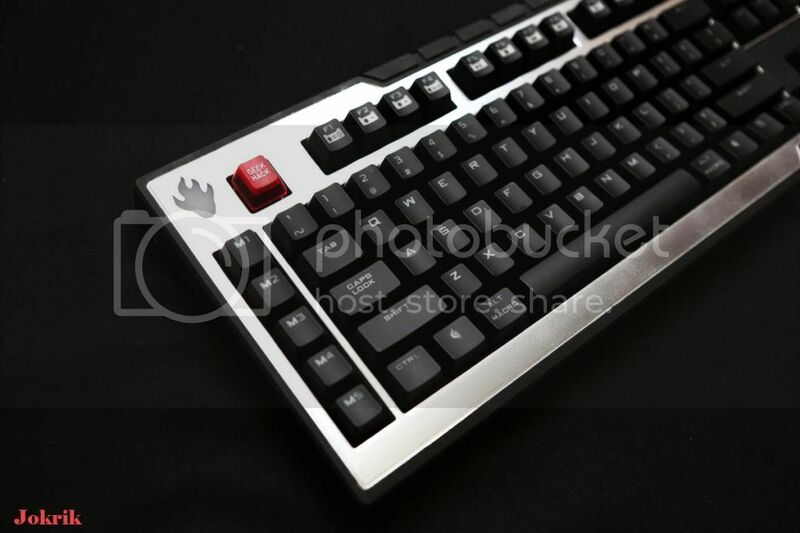 I will be getting a Ikbc f104 White and i wanna paint it. But what colour combination to paint? PURPLE!!!! 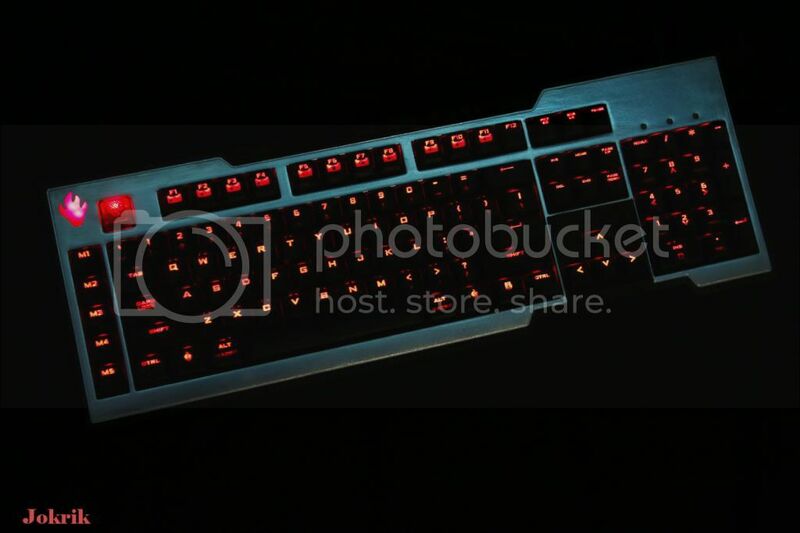 But seriously....I would suggest taking a good photo of your keyboard when you get it and play around in Photoshop (or Paint.net since it's free). That way you can get a better idea of what colors you are looking for without having to waste money on paint you won't use. I literally love everything in this thread. 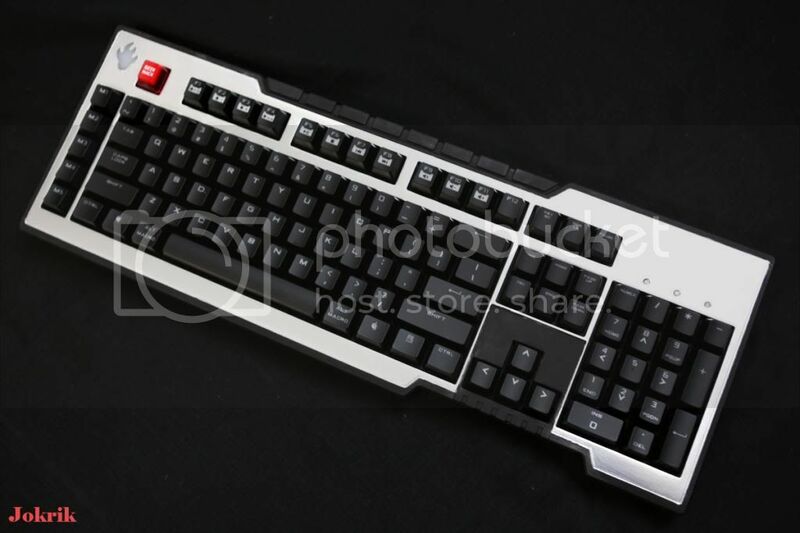 hey, just wondering, I easily disassembled my filco, and looks easy to paint all except for the logo, is there a way to do this? Yes, please see the links in the first post.